Professor of Southeast Asian politics at the University of Leeds and a visiting scholar at Columbia University. The announcement in February this year that the Thai government was engaging in negotiations with militants to try to broker an end to violence in the southern border provinces was widely hailed as an historic breakthrough. The reality is likely to prove a little more complicated. 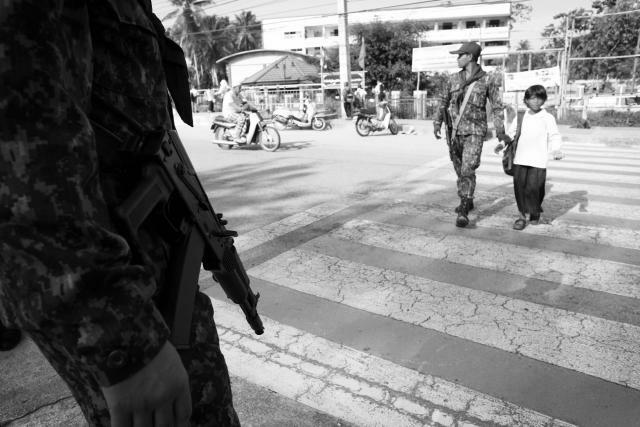 More than 5,300 people have been killed in an ongoing insurgency in Thailand’s Muslim-majority southern border provinces since 2004; from 2004 to 2007, this was the world’s most intensive insurgency after Iraq and Afghanistan. What was old, old news was the revelation that the Thai authorities were talking to militant groups in Malaysia. Indeed, some of the first acknowledged dialogue meetings took place under Malaysian auspices, when former prime minister Mahathir Mohamad convened a couple of meetings on the island of Langkawi, in which Thai officials, including the then head of the National Security Council and a senior general, took part. Shazryl Eskay Abdullah, the honorary consul at the Royal Thai Consulate in Langkawi, served as a facilitator, along with an ex-police chief of Malaysia. The government in Kuala Lumpur was kept informed, but no serving Malaysian officials took part. Former Thai prime minister Anand Panyarachun, who was serving at the time as chairman of the government-appointed National Reconciliation Commission charged with recommending solutions to the conflict, also joined the talks. Other participants included representatives from the militant groups BRN (Barisan Revolusi Nasional), GMIP (Gerakan Mujahideen Islam Pattani; Malay, Pattani Islamic Independence Movement) and PULO (Patani United Liberation Organization), as well as Dr Wan Kadir Che Man, a former head of the now-defunct Bersatu (aka Council of the Muslim People of Patani). However, Mahathir’s initiative was largely ignored by the Thaksin Shinawatra government, which was preoccupied with an extended domestic political crisis which culminated in the September 2006 military coup. Anand told me himself that the militant representatives he met in Langkawi had no interest in any political solution such as autonomy; the Langkawi discussions were little more than a confidence-building measure, rather than a prelude to serious negotiations. Since then, there have been several other dialogue processes. These have included the 2008 Bogor meetings brokered by the Indonesian government, ongoing initiatives by two European agencies which peaked during the 2009-2011 Abhisit Vejjajiva government, 2010 moves by the Organization of Islamic Countries, and some personal 2012 diplomacy by self-exiled former premier Thaksin Shinawatra, which was supported by the Southern Border Provinces Administrative Centre, a civilian government agency. All these attempts at dialogue have been afflicted by the same problems. The first is: who speaks for the Thais? The Thai state is far from a unitary actor: the Southern conflict is under the jurisdiction of several competing groups and agencies. While in theory prime ministers and their cabinet subordinates are in charge of the issue, in practice much of the strategic thinking has been done by the National Security Council (NSC)—something of a paper tiger. At the same time, despite the key role supposedly granted to the civilian Southern Border Provinces Administrative Centre (SBPAC), the Royal Thai Army has often behaved like a colonial overlord in the deep South, and monopolizes much of the special budgetary allocations for the region via ISOC (Internal Security Operations Command) a Cold War-era umbrella agency which was given enhanced standing and resources after the 2006 coup. There is intense distrust between elected politicians and these competing bureaucratic entities; any dialogue process ‘owned’ by one partner is likely to be quietly disowned by the others. A second problem is simply: dialogue about what? The conflict is essentially a political problem. 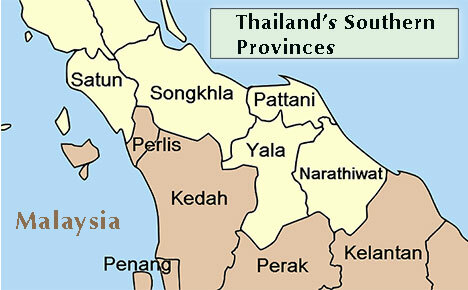 The Thai state has a legitimacy deficit in a region where most people are Muslim and speak a local form of Malay as their first language. But successive Thai governments have tried to deny the political nature of the militant cause, waffling endlessly about drugs, smuggling and criminality, and have been unwilling to talk seriously or consistently about autonomy or other forms of decentralization. Given the serial insincerity of the government side—Thai security officials often see ‘dialogue’ primarily as a means of identifying and neutralizing militant leaders—why should any militants engage in substantive discussions? A third problem is: who can speak for the militants? Despite persistent attempts by the Thai authorities to portray the militants as a cohesive top-down organization known as ‘BRN-Coordinate’, in which a small group of leaders have substantial command and control over local cells, many analysts believe that the juwae (young fighters) are decentralized, have connections and allegiances to a range of groups and older-generation leaders, and cannot readily be corralled into a ceasefire or a shared set of proposals. Successive dialogues have generally involved self-proclaimed separatist leaders based in Malaysia or elsewhere, many of whom are at best tangentially connected to the current juwae. Unlike militants in other conflicts—such as the Provisional IRA and Sinn Fein in the Northern Ireland case—the groups actively fighting in the region do not have a genuine ‘political wing’ which is capable of conducting negotiations on their behalf. What was new about the 27 February announcement? The direct involvement of serving prime ministers in both Thailand and Malaysia was a striking development, suggesting a much greater level of executive commitment. For the first time since taking office in mid-2011, Prime Minister Yingluck appeared to be making the South a top priority. A public signing ceremony with NSC chief Lt-General Paradorn Patthanatha-butr, seen as close to Thaksin, was also unprecedented. Malaysian prime minister Najib Razak’s statement that further talks would take place in two weeks suggested some significant momentum. Najib had every incentive to push for progress: he badly needed some favourable coverage as he approached a very challenging 5 May general election, which saw his party perform badly and significantly undermine his standing. But in certain other respects, the new southern Thai dialogue somewhat resembles the previous six or more dialogues. There is little evidence that the Thai military is on board; Army Commander General Prayuth Chan-ocha has sounded distinctly skeptical. There is no clear signal that a political solution might be on the table; mixed signals have been issued by different government agencies about the options for future discussion. A particularly unhelpful role has been played by deputy prime minister Chalerm Yubamrung, who has been tasked with overseeing the security issue in the South. His outspoken statements to the media have often seemed like deliberate spoiling tactics by the Bangkok government. The 9-member Thai team has gone to the talks with little prior preparation, and apparently without having agreed a clear collective line. The team includes three core figures, Paradorn, Tawee Sodsong who heads the Southern Border Provinces Administrative Organisation, and General Nipat Thonglek, deputy permanent secretary of the ministry of defence. A senior ISOC officer, Major-General Nakrop Boonbuathong, serves as the eyes and ears of the military, keeping Army commanders closely informed concerning the progress of the talks. The team also includes a Muslim civil society leader and a Pattani-based Buddhist academic, both of whom lend additional credibility to the negotiation process, though their precise role during the negotiations has not been clearly defined. Perhaps most seriously, it remains unclear that Hassan Taib, the lone BRN ‘leader’ who signed the agreement, has the standing, connections or authority to negotiate, let alone to deliver, any sort of settlement. Founded in 1960, the BRN long since split into three different groups, and while the 6-member BRN team has been reorganized since the beginning of the talks, major players in the organization remain in the wings, rather than around the negotiating table. There has been widespread speculation that Hassan Taib’s participation in the talks was arranged by the Malaysian Special Branch, and that members of the insurgent groups who have long been resident in Malaysia had little choice but to show up for the dialogue process. In other words, this was not a voluntary and spontaneous process, but one orchestrated by the Malaysian state for its own purposes. Nevertheless, the role of the Special Branch has been reduced over time, and the talks have begun to take on more of life of their own. The BRN delegation sought to seize the initiative in the second meeting by articulating a list of five demands: Recognition of Malaysia as a mediator; the release of prisoners held on security charges; dropping of arrest warrants; recognizing the rights of Malay Muslims as owners of ‘Patani’; and, acknowledging BRN as a liberation movement. This list of demands suggested a degree of planning and forethought which wrong-footed the ill-prepared Thai delegation, leaving the Bangkok government floundering to respond. A major problem with this peace process is the extent to which it reflects Thailand’s profoundly divided and dysfunctional domestic politics, which have proved a major stumbling block to attempts to address the Southern conflict. While the Abhisit government lent support to the Geneva process involving an international NGO, the Yingluck government has distanced itself from that initiative and is backing a process for which the driving force is the self-exiled former premier Thaksin Shinawatra. Paradorn, Tawee and Nipat are known to be in regular communication—including during the Kuala Lumpur talks—with Thaksin, receiving a stream of messages and calls from Dubai. Thaksin’s involvement in the process makes it highly questionable in the eyes of his many political opponents and critics, who hold him at least partly responsible for the dramatic escalation of the insurgency during his period as prime minister (2001-06). Thaksin’s own attitude to the conflict has been difficult to pin down; since leaving Thailand in 2008 his behavior has become ever more mercurial, and in a recent book-length interview with American journalist Tom Plate, Thaksin sought to blame Malaysia for the deaths of 78 unarmed protestors at Tak Bai in October 2004. But despite flirting intermittently with bizarre conspiracy theories, Thaksin has also apparently decided that helping to find a solution to the violent conflict that has claimed so many lives could rehabilitate his image and prepare the ground for his eventual return to Thailand. Some of those criticizing the Kuala Lumpur peace talks are primarily animated by deep misgivings about Thaksin’s role in the process. It is certainly true that Thaksin—whose heavy handed actions in 2004-05 were so incendiary—seems a most unlikely peace-maker. But to write off the negotiators as ‘Team Thaksin’ would be unduly simplistic; breakthroughs in apparently intractable conflicts may sometimes be made by politicians driven by extraordinary personal confidence, as Tony Blair demonstrated in Northern Ireland. On the ground, many of the juwae who carry out daily violent attacks seem unimpressed by a peace process that seems extremely remote from their own struggle. Nor have the talks been supported by student or youth movements on the ground, who generally regard them as pretentious and inauthentic. Since the latest dialogue began, there have been numerous savage attacks on both military and civilian targets, some of which appeared to serve as deliberate reminders that there has been no agreement to date. But following a call from all 643 imam in the troubled region, at the latest round of talks on 13 June, BRN agreed to support a partial or total Ramadan ceasefire, as a gesture of goodwill to demonstrate that the negotiators were able to influence the violence on the ground. Much now hinges on whether such a ceasefire can in fact be delivered, in the face of considerable public misgivings in Bangkok about a process that has yet to produce any tangible results. All talks that might help to reduce fighting are welcome, but the latest Southern Thai peace initiative will need much greater commitment from both sides if serious progress is to be made. Duncan McCargo’s books on the Southern Thai conflict are Rethinking Thailand’s Southern Violence (ed., NUS Press 2007), the Bernard Schwartz prize-winning Tearing Apart the Land: Islam and Legitimacy in Southern Thailand (Cornell 2008, Thai translation Kobfai 2013), and Mapping National Anxieties: Thailand’s Southern Conflict (NIAS 2012).